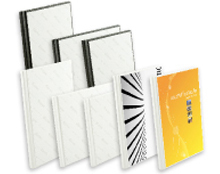 Use the new Fastbind PrintMount Covers to make personalized hardcover books quickly and easily. Covers have a glue sheet in the front cover for easy mounting of cover prints. You can make personalized covers even with a standard A4 printer or small photo lab. 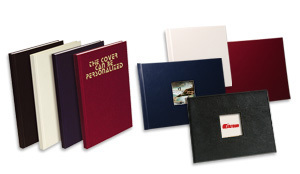 Pre-Made covers offer the fastest and most efficient way to finish hard covers when binding. Fastbind Manager Hard Covers for BooXTer Binders are available in 9.5 mm spine thickness for content max 8 mm. Several landscape and square covers are also available with akeyhole window. Standard colors for Manager hard covers are black dark blue dark red and white.